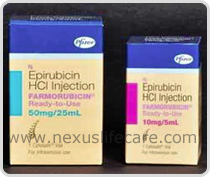 Uses:- Epirubicin Injection is used to treat breast cancer. It belongs to a class of drugs known as anthracyclines and works by slowing or stopping the growth of cancer cells. Side Effects:-Nausea, vomiting, diarrhoea, abdominal pain, flushing, or skin/nail colour changes, Hair loss etc.